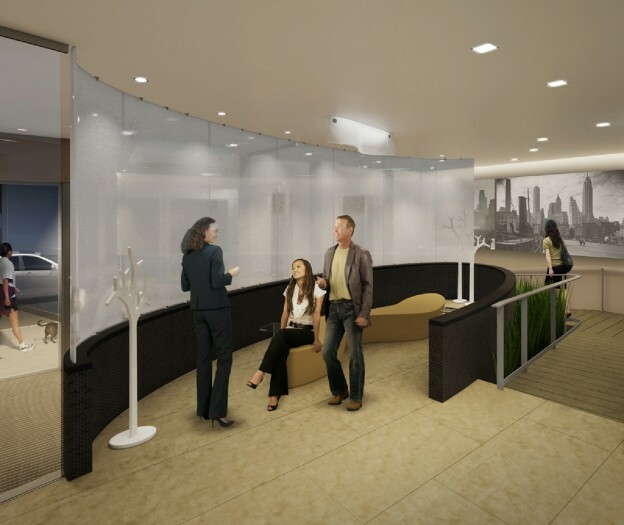 Design and specification of the Lobby and Corridors for a high-rise mixed-use residential building in the waterfront redevelopment sector of Hoboken—designed for LEED Gold Certification. Interior green elements include low-VOC paints, carpet containing recycled content, and energy efficient lighting. The main entry ramp is flanked by a stone garden and surrounds a featured elliptical shaped seating area. The featured architectural ellipse is clad with stone mosaic tiles and custom-formed acrylic resin embedded with crushed glass for a filtered opaque effect. Furniture specifications include a freeform leather bench, acrylic “Z” side tables, and a playful mix of faux trees and real planters. Elevator lobbies at each level feature large format porcelain floor tile, polished plaster walls, and a linear stone mosaic accent wall. The primarily neutral corridors are accented at the unit doors with vibrant and playful colors taken from the accent threads in the corridor carpet.